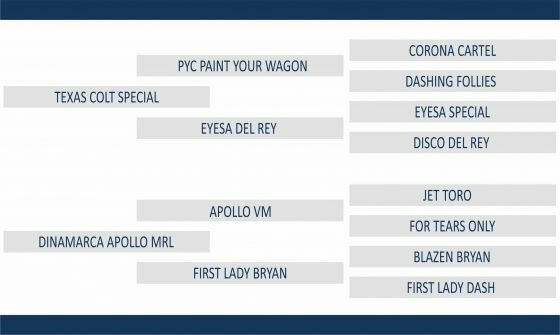 PYC PAINT YOUR WAGON: PYC PAINT YOUR WAGON: SI-106, ganhador do Futurity Texas Classic (G1), Vencedor do Heritage Place Derby (G1), trazendo ganhos acima de U$ 650 mil dólares. CORONA CARTEL: AAA-97, ganhador clássico de 6 corridas, US$ 557.142 em premios, 1o. Los Alamitos Million Fut.-G1, 1o. Kindergarten Fut-G2., 1o. Tiny s Gay H., finalista do PcQHRA Breeder s Derby-G2, Vandy s Flash.H.-G3, etc. 2º maior Reprodutor vivo por somas ganhas de todos os tempos nos EUA. Pai de 92 ganhadores clássicos, 48 Superior Race Awards, 22 Champions, 1 Campeão Mundial, que já acumulam mais de US$ 38,281,227 em premios. Destaque para : BLUES GIRL TOO AAAT-104 (8 vitórias, $ 2,032,328, World Champion Racing American, 1º Los Alamitos Two Million Futurity-G1, 1º Champion of Champions-G1, etc. ), TELLER CARTEL AAAT-108 (3 vitórias, $1,212,471, AQHA Racing Champion, 1º All American Quarter Horse Futurity-G1, etc. ), EYE FOR CORONA AAA-99 (4 vitórias, $1,100,121, 1º Golden State Million Futurity-G1, etc. ), PYC PAINT YOUR WAGON AAAT-107 (7 vitórias, $ 889,581, 1º Texas Classic Futurity-G1, 1º Heritage Place Derby-G1, etc. ), REMEMBER ME ROSE AAAT-110 (9 vitórias, $ 820,895, 1º Ruidoso Derby-G1, etc. ), CARTERS CARTEL AAAT-103 (6 vitórias, $ 659,146, AQHA Racing Champion, 1º Ed Burke Million Futurity-G1, 1º Kindergarten Futurity-G1, etc. ), FANTASTIC CORONA JR AAA-97 (7 vitórias, $ 541,811, 2º All American Derby-G1, etc. ), CORONA FOR ME AAA-99 (4 vitórias, $ 375,718, 2º Los Alamitos Million Futurity-G1, Reprodutor Líder das Estatísticas no Brasil em 2009/2010. ), etc. HOLLAND EASE : SI 109, U$361,227.00, nos EUA seus filhos já ganharam mais de U$ 12 MILHÕES, incluindo: _PLANET HOLLAND (MACHO), SI 127, por Mr Eye Opner, U$798,885.00, Recordista Mundial das 350yds. (17.006), Ganhador do Rainbow Futurity-GI; _CORONA CARTEL (MACHO), A Lenda Viva, SI 97, por Chicks Beduino, U$557,142.0 , Ganhador do Los Alamitos Million Futurity-GI, produtor de mais de U$ 40 MILHÕES; _WINNERS VERSION (MACHO), SI 103, por Runaway Winner, U$399,046.00, Ganhador do Hobbs America Derby-GIII, Finalista do Golden State Million Futurity-GI, Rainbow Futurity-GI, Los Alamitos Two Million Futurity-GI, All American Futurity-GI, Ruidoso Futurity-GI, Rainbow Derby-GI, etc; _HONOR EASE (FÊMEA), SI 109, por Requested Honor TB, U$368,507.00, 16 vitórias, Recordista Mundial das 400yds. (19.18), Ganhadora do West Texas Sun Country Futurity-GI, West Texas Derby GIII, American Quarter Horse Foundation Stakes, Finalista All American Futurity-GI. Seus filhos já ganharam mais de U$200 mil, incluindo: oEASY SEPARATION, SI 105, por Separatist, U$56,407.00; oBIG TIME STOLI, SI 98, por Stoli, U$30,889.00; oFEATURE HONOR, SI 106, por Feature Mr Jess, U$26,220.00; oEASY LAUNCH, SI 89, por Apollo TB, U$23,175.00; CORONA CHICK: AAAT-113, por Chicks Beduíno. 15 vitórias em 18 atuações, US$ 591,326 em prêmios, CHAMPION, 1º Ed Burke Memorial Futurity-G1, Dash for Cash Futurity-G1, Kindergarten Futurity-G1, Governor s Cup Derby [R]-G1, Governor s Cup Futurity [R]-G2, 2º Southern California Derby-G2, Finalista do Bay Meadows Futurity-G1, etc. Recordista das 400 jardas em Hollywood Park (19,63) e das 350 jardas em Los Alamitos (17,22). Mãe de : * CORONA CASH AAAT-101, por First Down Dash, ganhadora clássica, ver acima * VALIANT HERO AAAT-105, por First Down Dash. 7 vitórias, US$ 668,633 em prêmios, 1º Texas Classic Futurity-G1,Heritage Place Derby-G2, Dash for Cash Juvenile Invitational [R], 2º Rainbow Derby-G1, Finalista do All American Derby-G1, etc. * CORONA CARTEL AAA-97, por Holland Ease. 6 vitórias, US$ 557,142 em prêmios, 1º Los Alamitos Million Futurity-G1, Kindergarten Futurity-G2, Tiny s Gay H., Finalista do PcQHRA Breeders Derby-G2, Vandy s Flash H.-G3. Reprodutor 2º colocado nas estatísticas de somas ganhas em todos os tempos (seus filhos ganharam mais de US$ 30 milhões em prêmios). * CORONA CZECH AAA-93, por First Down Dash. 6 vitórias, US$ 125,759 em prêmios, Superior Race Horse, 1º Mr Jet Moore H., 2º El Primero Del Ano Derby-G2, Finalista do Golden State Futurity-G1, Ed Burke Memorial Futurity-G1,etc. * Mighty Corona AAA-99, por First Down Dash. US$ 309,216 em prêmios, 2º Texas Classic Futurity-G1, Finalista do All American Futurity-G1, etc. * Captain Courage AAAT-100, por Mr Jess Perry. US$ 213,251 em prêmios, 3º All American Futurity-G1, Finalista do Texas Classic Futurity-G1, etc. * Coco Corona AAAT-115, por First Down Dash. 4 vitórias, US$ 37,414 em prêmios, 3º Corona Cartel S., Finalista do Rainbow Futurity-G1, etc. * Corona Caliente AAAT-101, por First Down Dash. 2 vitórias, US$ 118,278 , Finalista do Los Alamitos Million Fut-G1, Golden State Fut-G1. Reprodutor. * King Corona AAAT-104, por Holland Ease. 3 vitórias, US$ 31,928 em prêmios, Reprodutor. STRAWFLY SPECIAL: STRAWFLY SPECIAL: SI 97 (1987). In QH races, stakes winner, $222,920, Southern California Derby, etc. Sire of 15 crops of racing age, 1444 foals, 1191 starters, 985 ROM, 79 stakes winners, 1 champion, 832 winners of 2139 races and earning $25,655,415 USA. Sire of dams of 49 stakes winners, including champions Flying Fig-QH, American Runaway-QH, Strawkins-QH, First Klas Fred-QH, and of Pyc Paint Your Wagon-QH, Charal Kid-QH, Dpi Good Boy-QH, The Goodbye Kisser-QH, Blazin Perfection-QH, Dealagame-QH, Short Czech-QH, Man On the Move-QH, Chicks Are Streakin-QH, No Dice Special-QH, Baby Im Game-QH DASHING FOLLY, SI 108, Campeã Mundial, 12 Vitórias, Ganhadora de $535,841. Champion 3-Year-Old, Champion 3-Year-Old Filly, Champion of ChampionsG1, Los Alamitos Derby G1, Mildred N Vessels Memorial H. G1, Vessels Maturity G1, Mildred N Vessels Memorial Han G1, 2º Go Man Go H.G1, 4Th Champion Of Champions. Etc… Mãe de, 7 ROM, Destaque para, * DASHIN FOLLIES Mãe de, 8 ROM, Destaque, *** PYC PAINT YOUR WAGON SI 107, 7 Vitórias. $889,591, Ganhador do Futurity Texas Classic (G1), Vencedor do Heritage Place Derby (G1). .***IVORY JAMES SI 103, 5 Vitórias, $220,026. 2 Heritage Place F.G1 fnl All American D.G1. Tx.Cl.F.G1 Remington Park F.G1 Remington Park D.G2. * SEPARATE FOLLY, SI 97, 3 Vitórias. $ 14,781. * SIXES FOLLY, SI91, 3 Vitórias $ 28,114. * DASHING FINISH, SI 102, 1 Vitória. $ 13,932. * SIXES CARTEL, SI 92, 3 Vitórias, $ 30,978. * COWBOYS CARTEL, SI 93, $ 7,512. EYESA SPECIAL: AAAT-107, por Mr Eye Opener, High Money Earning Horse, AQHA Racing Champion Two-year-old, 6 vitórias, US$ 1,394,911 em premios, 1o. All American Futurity (G1), Texas Classic Futurity (G1), 3o. Remington Park Derby (G1), etc, . Com 7 gerações corridas nos EUA, é pai de 175 ROMs, 9 Superior Race Awards, 3 Champions, U$ 4,366,991 em prêmios, com destaque para : EYESA JUMPN (AAAT-108, 9 vitórias, $ 460,270, 1º Harrah s Ent.Fut.-G2, 1º Harrahs Ent. Derby-G2, etc. ), EYESA SHAKER (AAA-99, 3 vitórias, $ 256,473, 1º Heritage Place Futurity-G1, etc. ), EYESA DREAMIN (AAA-99, 5 vitórias, $ 121,386, 2º Choctaw Blue Ribbon Futurity-G2, etc. ), ALL WACKED OUT (AAAT-100, 8 vitórias, $ 115.000, 1o. All Canadian Derby, etc. ), I OPENING SENSATION (AAAT-104, 8 vitórias , $ 112,792 , 1º West/Southwest Champ. Challenge-G2, etc), EYESA CANDY MAKER (AAAT-109, 5 vitórias, $ 106,494, 3º Remington Park Derby-G1, etc. ), EYESA FIRST (AAAT-104, $ 105,700 em prêmios, 1º Kansas Futurity-G2, etc. ), etc. No Brasil, com apenas 2 gerações corridas, produziu : ESPECIAL BOLT PK (AAA-94, 4 vitórias em 4 ats., R$ 250.000 em prêmios, 1o. GP Brazilian Futurity/11, 1o. GP Vitória Ranch/11 no RJ. ), MR EYESA TAC (Vencedor IV GP Haras Primavera/11 no Canindé-CE), Merry Eyesa (AAA-91, Finalista GP Torneio Inicio/11), Abusada Santana (Finalista II GP Fortaleza Horse Show/11 em Caucaia-CE), Love Eyesa SLN (Finalista GP Carlos Flores/11 em Ponta Porã-MS), Special Eyesa CAR (Finalista IV GP Haras Primavera/11 no Canindé-CE), etc. DISCO DEL REY: SI 112; & All-American Futurity G-1 finalist Ghost Witha Most. The first mare he was ever bred to (Send Me Candy, by Tiny s Gay), says Stanley produced a gray gelding named Send The Gals Candy, that made $291,000 on the track. The gelding also set a track record at Los Alamitos. DISCO JERRY: Winner. Half brother to KANUSUE. Sire of 197 ROM, 12 stakes winners, $2,454,103, including SEND THE GALS CANDY SI 105 (6 wins, $291,286, Sunland Park Fall Fut. [G2]), IMAFASTERMASTER SI 97 ($222,655 [RG1]). Sire of the dams of MISS BLUE CHEW SI105 ($349,728 [G1]), THIS CANDYS OKAY SI 109 ($218,355 [RG3]), SHEZA DASHING DICSO SI 98,DASHDELREYSI 103,TREVORSEASYTIPPER.